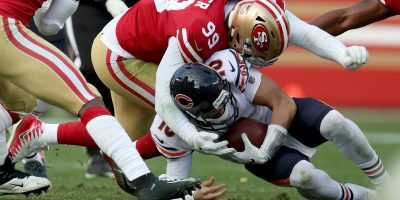 LEVI’S STADIUM — The San Francisco 49ers spoiled their own homecoming Sunday afternoon with a lackluster shutout performance at the hands of the Denver Broncos, who embarrassed the team in their new confines with a 34-0 beating. San Francisco’s play was abysmal on both sides of the ball, gaining just 230 total yards with four turnovers on offense while being steadily picked apart by the Broncos during their defensive sets. Quarterbacks Payton Manning, Brock Osweiler and Zac Dysert combined to complete 30 of 38 passes for 270 yards and three touchdowns. The Broncos kept the 49ers defense on their heels by rotating a mixture of short passes to the flat and deep routes against the coverage of the young San Francisco backfield. 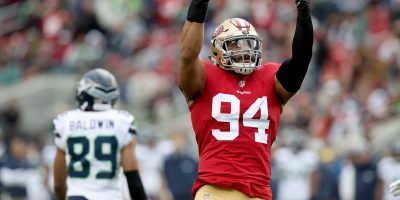 The 49ers’ defensive depth chart was exposed during the game, with starters Ray McDonald, Ian Williams, Justin Smith and Tremaine Brock remaining out of action. Safety Craig Dahl filled in for the injured Antoine Bethea after a first quarter concussion and was immediately targeted by the wily Manning for a touchdown across the middle to Julius Thomas for the game’s first score. 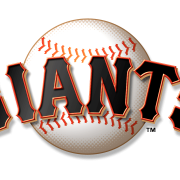 Likewise, cornerback Dontae Johnson gave up a touchdown on a deep go-route to rookie Cody Latimer for a 33-yard touchdown in the third quarter. There appeared to be no further distinction in battle between linebackers Chris Borland and Michael Wilhoite, who both put together solid outings. Willhoite tied Jimmy Ward with a team-high seven tackles while looking good in both the pass rush and coverage. The defensive effort was overall fairly bleak, though a silver lining could be found in rookie Kenneth Ackers. The 22-year-old played tight coverage all day, breaking up a few passes and allowing no big plays when targeted. Acker also would have had a highlight after coming up with a pick, but teammate Aaron Lynch’s offside penalty negated the call. Not all of the blame could be placed on the secondary’s shoulders. The defensive line didn’t supply it’s usual staunch pressure, giving Denver’s quarterbacks plenty of time to operate in the pocket. However, that issue will most likely be resolved with the return of Smith, Williams and McDonald. Even with the defensive shortcomings, the elephant in the room is still the 49ers lackluster offense. 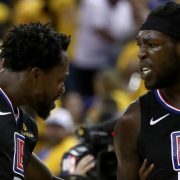 The 49ers have managed just three points in two exhibition games, getting outscored 57-3 while failing to mount anything impressive. 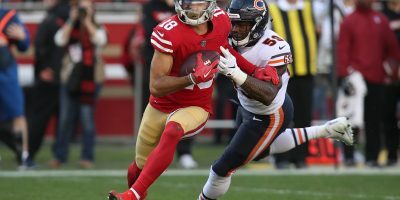 Kaepernick (5-9, 39 yards) put together a pair of solid drives Sunday, though his numbers were skewed by a few drops, most notably a deep pass to receiver Brandon Lloyd in the end zone. But the real question mark lies on the shoulders on Blaine Gabbert, who turned in his second grisly performance of the preseason. Gabbert connected on 8 of 14 passes for just 40 yards while tossing another interception, his second of the preseason. Gabbert has yet to show his ability to move the ball downfield with command, with his longest connection being a 12-yard pass in two games. 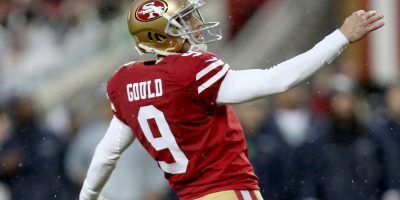 Gabbert’s 32.4 passer rating today far surpassed last week’s 1.7, though the former 10th overall pick has yet to show any sign of being a competent backup for Kaepernick. That message doesn’t just bode poorly for Gabbert, as Josh Johnson and McLeod Bethel-Thompson also had turnovers on the day. The day’s biggest surprise was the struggle of veteran kicker Phil Dawson, who has been rock solid after taking over for David Akers last season. Dawson uncharacteristically missed the only two chances to put the 49ers on the scoreboard. The first attempt came at the conclusion of Kaepernick’s opening drive, where a 55-yard attempt sailed wide right of the goal post. Dawson would get another attempt in the second quarter, where a 44-yard try was met with the same result. Despite the lack of production from the offensive unit as a whole, wide receiver Bruce Ellington has continued to make the most of his preseason snaps. For the second game in a row Ellington was the teams top-producing receiver, catching four passes for 24-yards. The rookie also handled return duties admirably with 2 returns for 28-yards. 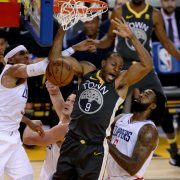 During a conference in which Kaepernick was stoic in his responses following a tough loss, Ellington was among one of the few who received praise from the quarterback. Harbaugh’s comment about getting yards after the catch were on display during the game, as the rookie showed his toughness by taking several big hits while fighting for yardage. Although fans can rely on the old adage that it’s “only the preseason,” the fact remains that the 49ers have some serious work to do before next weeks game against the San Diego Chargers. 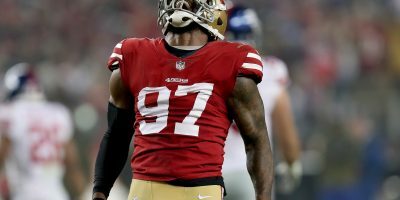 Despite the early struggles, the 49ers are making mistakes during the appropriate time to do so, leaving a generous amount of time to correct them. 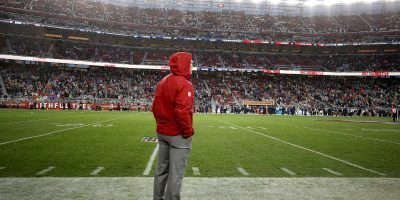 While some of the 49er faithful may be ready to sound the alarm, Harbaugh is among those who remain optimistic about a quick turnaround the the team’s woes.